I spent some time trying to set up Zend Framework using the Quick Start Guide, combined with the Dwoo Template Engine. Even though there is an actual guide written for the Zend Framework side, as well as a Dwoo adapter and corresponding wiki help page – there still seems to be a lot of confusion around this setup process. The number of complaints in the comments in the quick start guide combined with the lack of help I was able to find through Google while attempting this myself has led me to write a post in order to hopefully help people dodge some of the problems and confusion. Let’s get started. Start out with the Zend Framework quick start intro. Download the framework, and follow the instructions to create a project. If you have any problems getting zf.sh/zf.bat to work correctly – remember that there is always the option of editing the _setupToolRuntime function in zf.php and just hard coding the path to the Zend library location. 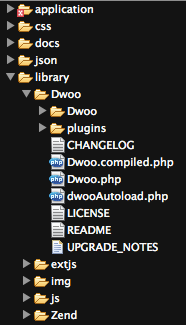 Structure for how I have Dwoo set up in my Zend Framework project. The code above will use the defined constants to create a secondary autoloader for Zend. In the event that the Zend autoloader is not able to find a file, it will resort to this autoloader (which will work correctly for Dwoo). The code then sets a few options to specify the compile and cache directories. Make sure these directories exist in your application and are writable (feel free to change the location of these directories).